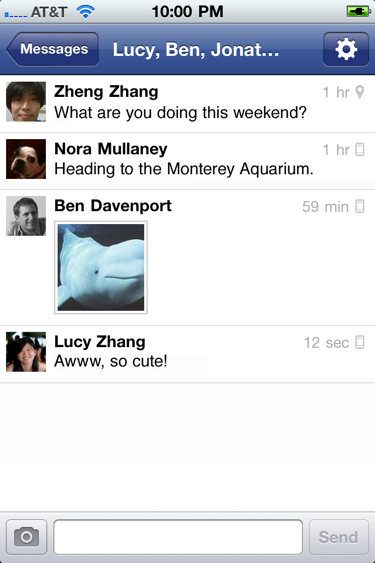 Back in February Facebook acquired Beluga, a hot group messaging startup well known for having a killer 3-person team. At the time, fellow TC writer MG Siegler wondered aloud whether Facebook would release a standalone messaging app (which is what Beluga is), or if it had plans to work the technology and team into its recently-revamped Messages product, which it unveiled last fall. Today, we’ve got our answer: Facebook is launching a standalone application called Messenger for iOS and Android, and it deeply fuses the best features of Beluga with Facebook Messages (and Facebook’s 750 million users). The app will be rolling out today on Apple’s App Store, and should be available immediately on Android Market. Update: Here’s the link for the iPhone app and Android app. (It looks like the app is still rolling out to some servers, so you may get an error). If you’ve used Beluga before, the app will be very familiar to you. And if you haven’t, it should also be pretty familiar — because it’s a lot like the web-based version of Facebook messages. Tap on Messenger and you’ll immediately see your list of recent conversations being held on Facebook (remember, because all of Facebook’s messages are now unified as part of the same platform, you’ll see both recent chats and direct messages here). The basic messaging features work as you’d expect: tap on one of your existing conversations and you’ll be able to shoot off a quick message. And if one of your friends (or friends-of-friends) shoots you a message when the app isn’t open, you’ll immediately get a push notification. You can easily set up a group by typing in your friends’ names — contacts are drawn from both your Facebook friends list and your phone’s address book. Messages to Facebook friends are obviously sent via Facebook Messages, and messages sent to contacts who aren’t on Facebook are sent via SMS. And you can rename and attach a photo to group message threads. The features that are more specific to Beluga are here as well. 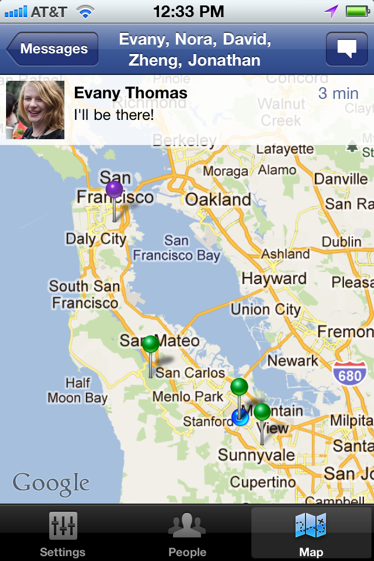 If your friends are sharing their location with their messages, you can plot the location of your group-members on a map. And if you need some quiet time, you can mute messages for an hour at a time, or until 8 AM the next morning (you can also mute a friend entirely if they’re annoying you). The app doesn’t have any surprises, but it doesn’t need to. The goal here is to get more people using Facebook messages, and by putting your inbox one tap away (instead of buried inside the ‘main’ Facebook application), it’s going to do just that. In the longer term Facebook clearly has ambitious plans around messaging. Messenger isn’t going to replace your phone’s SMS application any time soon because all outbound texts come from one of Facebook’s shortcodes rather than your phone number. But if all of your friends are using Messenger anyway (and that’s a huge if)), then you won’t need to SMS them in the first place. Today’s launch is also notable because this is the first time Facebook has released a standalone mobile app for one of its products (historically all mobile apps are just called ‘Facebook’, and include as much functionality as Facebook can bake into them). This may well pave the way for more standalone applications, like the secret Photos app that’s in the works. Finally, while the Messenger team (which is the former Beluga team) says that Beluga will keep running for now, it isn’t clear exactly what Facebook will do with it down the road.